This article appeared in the September 1996 Falco Builders Letter and was originally published in The Aviation Consumer. Everything the Falco is, the An-2 isn't. If your Otter's too old, your Beaver's too small or your Norseman can't get it up any more, maybe what you need is a Kolkhoznik. No, I'm not talking about adult toys but the Antonov An-2, the world's biggest biplane. Far cheaper than a de Havilland Otter, way bigger than a DH Beaver and offering lots more utility than a Noorduyn Norseman, the An-2, long ago nicknamed the Kolkhoznik ("Collective Farmer"), is a 1,000-horsepower, radial-engine, 12-passenger monstrosity that is appearing in increasing numbers on U.S. ramps and runways; there are currently 34 in the U.S., seven of which are for sale at prices ranging from $37,500 to $69,000. Eastern-bloc entrepreneurs are hustling to satisfy our urge to consume anything with wings that offers even a hint of communist-bloc warbird status. An-2s were used by the Soviet army to carry paratroops-indeed the airplane itself flies like a parachute-and though their code name "Colt" certainly is laughable for an airplane that is the opposite of frisky, they are a legitimate ex-military type. Many of them are also former airliners. Right up until the collapse of communism, Aeroflot held the record as the world's largest airline, both in terms of miles flown and passengers carried. This was not because they had lots of turbofan Tupelovs, Ilyushins and Concordskis but because millions of those miles and passengers were flown and carried by simple An-2s chugging in and out of Siberian goatfields, Kazakh soccer patches and grass strips from Minsk to Pinsk. Though Aeroflot has since shattered into dozens of individual airlines, the Kolkhozniks are still out there flying difficult, demanding domestic legs. 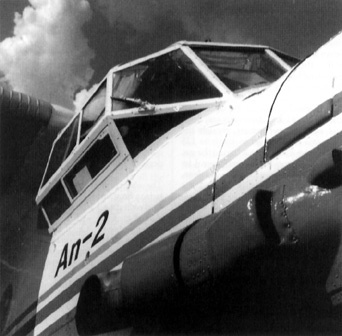 When it was designed, in 1947, the An-2 was a remarkable achievement. It's easy to make fun of a single-engine, tailwheel, round-engine, biplane airliner with all the grace and mechanical refinement of the Wabash Cannonball, but no airplane before or since has been able to carry as much into strips as short and be as maintainable and utilitarian as "the Ant." The An-2 gets the job done thanks to full-span automatic leading-edge slats, full-span flaps on the lower wing, more flaps on the upper wing that work in conjunction with ailerons that droop 14 degrees, and an enormous engine that is in fact a licensed copy of the original Wright R-1820 Cyclone, one of the world's most durable aircraft engines. Lots of DC-3s ran around under the urging of a pair of Wright R-1820s, though the smoother Pratt R-1830 Twin Wasp was preferred by most Doug Racer pilots. Indeed, if the DC-3 was our contribution to the age of iron aircraft, the An-2 was the Soviets' equivalent-an airplane ahead of its time when it was introduced, that has lived on far past its time. 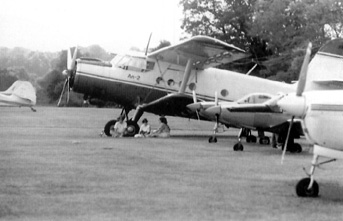 No airplane in history has been in continuous production essentially unchanged as long as the An-2. In fact, you'd be hard-pressed to name any complex machine that has been manufactured as long. First flown in 1947, it went into serial production in 1950 and is still being built today. (I saw a dozen of them on a stalled production in Mielec, Poland during a research trip for Aviation Consumer in 1994, and someday soon, those airplanes will come out the door as yet more brand-new An-2s.) Bonanza enthusiasts will argue the point, but the still-in-production Bo bears as much similarity to the 145-hp, vee-tailed Beechcraft that went into production in 1947 as does a DC-4 to a DC-3. 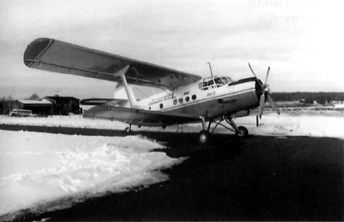 The sole "major" An-2 airframe change over half a century was a squared-off vertical fin and rudder brought on line in 1964. The An-2 is loaded with nice touches that make it clear it's meant to operate in the field-way out in the field. The two huge batteries, for example, slide in and out of their racks on trays with built-in connectors, so you can recharge them easily or take them into the yurt with you on a cold Siberian night. The belly of the airplane has pneumatic connectors that allow hooking an air hose to the airplane's on-board compressor (for the air-brake system) so you can pump up the main or tailwheel tires after service. And the main tires themselves don't mount on pesky, tube-eating split wheels but have removable truck-type beads, so there's no need to disassemble the wheel and brakes. There's another belly fitting behind a small door, plumbed into the airplane's fuel system, that allows your crew chief-you do have a crew chief, don't you?-to drape a hose into a 55-gallon drum and upload gasoline using ship's power to pump it. And if you left your ladder back at home base, there are four kick-in steps built into the Ant's aft fuselage that lead to a catwalk up the aircraft's spine, out the wings to the fuel tanks or over the birdcage windscreen to the oil reservoir. The oil tank holds 32 gallons, although the engine can safely be operated on as little as six. "Fill it up, and you might not have to do another thing about oil for three months," one An-2 owner told me. Well, maybe... another former An-2 pilot reminisced about his perhaps-leakier aircraft and said, "As I remember, it was a very safe system: you ran out of fuel just before you ran out of oil." So what is it like to fly an An-2? Let's be honest here: Out of 115 separate types logged over 29 years, this is the single most unpleasant airplane I've ever flown. Not because it's nasty-it's certainly the most benign large airplane in my experience as well-but because it combines the challenge of instruments as random and unfamiliar as those in a slumlord's boiler room with the manipulation of controls straight from the Allis-Chalmers School of Design plus the physical demands of roll and pitch forces that must have produced entire generations of Aeroflot weight-lifting teams. (The only systems as heavy that I've ever experienced were a BAC 111 in manual reversion, with the hydraulic boost shut off.) Other than that, it's a piece of cake. If you detect an incipient hydraulic lock, pulling a sparkplug will drain it, but another option is turning the prop backward, which will safely force the oil out an intake valve. "You'll end up with oil all over the starboard side of the airplane when it fires up, but at least you're up and running in 10 minutes," says An-2 importer Bill Walker, of St. Simon's Island, Georgia. It takes that long because the next step is to run the engine at dead-idle for about a minute, till all the excess oil has been spit into the exhaust collector ring but before the collector has heated enough to burn the oil. Then you shut down, get out and drain the exhaust low point again. You'll want to leave the oil-draining till last, after the usual flurry of control-lock removal, slat-checking and systems preflights. While I was visiting Walker's An-2 operation on St. Simon's, a genteel resort island just off the coast of Georgia near Brunswick, the telephone in his office rang with a call from a dismayed new An-2 owner who had ruined the engine on his very first start-up. He'd known enough to drain the bottom cylinders but had let an hour elapse between preflight and going flying, and it was just enough time for oil to sneak back down into the bottom cylinder. An An-2 walkaround reveals a number of interesting and unusual details. Proper main-gear strut extension, for example, is checked by opening a door on the gear-leg fairing that reveals a sliding scale of marks corresponding to various airplane weights. If the index mark on the strut matches the mark for your all-up weight, all's well. If not, hook an air hose to one of the belly pneumatic fittings and pump 'em up. The leading-edge landing and taxi lights are ordinary bulbs backed by silvered-or, after a few years of service, silver-painted-reflectors. The bulbs were probably replaceable at whatever the Soviet equivalent of a Pep Boys store was. Though at least one An-2 owner claimed the lights are "excellent," they look decidedly low-tech. But hey, if things get that dark, there's a small, downward-facing port on the copilot's side of the cockpit, sized to accept the barrel of a flaregun. Don't bother keying the mike to turn on the runway lights, just buzz the strip and fire off a couple of illuminating flares. 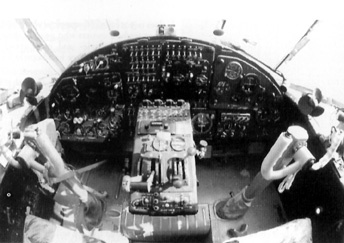 Another classy feature of An-2 night flight is the instrument panel. All the dial markings are painted with radium, a technique outlawed in the U.S. decades ago. The "floodlights" are actually ultraviolet, to excite the radium. "It's the only airplane I know of that you can fly at night and get a sunburn," one An-2 owner said. The leading-edge slats are held closed by simple rubber bungees. You check them by climbing a stepladder, pulling the the slats out and checking that they close enthusiastically enough to try and bite your fingertips off. And one nice touch, there's a little light built into the fuselage side just above the ground-power socket aft of the passenger loading door. It goes on when the pilot switches to battery power, so the poor crew chief, standing back there in the Siberian propwash, knows that he can unplug the power cart and hustle indoors. The An-2 is cranked by an inertial starter-a big flywheel spun into life by a teacup-size electric motor. You can engage it in a variety of ways, some of which require more hands than I have. There's a certain amount of careful priming to do first, after wobble-pumping with a stalky lever below the captain's chair, but then you either manually engage the rapidly spinning flywheel to crank the engine by pulling a tee handle with one hand and feeding it spark and fuel with your other two, or you push a button for "electronic start," turn on the mags after a few blades have passed the windscreen and stand by the throttle. Either way, it's the usual Return of the Industrial Revolution sound and smoke as the round engine catches -- effortlessly, on the day that Walker and I flew his N76AN -- and the copilot gets the benefit of most of it: the exhaust outlet is on the right. Taxiing an Ant is an art. The brakes are pneumatic, operated by a lever resembling a bicycle handbrake on the left horn of the pilot's yoke, and big biplane rumbles along breathing a loud refrain of hisses and groans-psssssss... tssssshhh... psssst... paaaaah-and sounding like an old Fifth Avenue bus. It only takes light dabs at the lever to provide directional control (by pulsing the lever while pushing one or the other rudder pedal), and "The airplane has so much brake it'll sit on its nose in a New York second," says Bill Walker's partner Charley Houck, a widely experienced ex-Army utility-plane pilot. "Some people make the mistake of thinking they've got hold of the yoke, and actually they've got the yoke and the brake," Walker points out. "I sold an engine and a prop the other day to a guy who did exactly that, pulled back on the 'yoke' and stood the airplane on its nose." How do you make a takeoff in an An-2? You don't. The airplane does. "The [Cessna O-1] Bird Dog is the only other airplane I've ever flown that takes off three-point," Charley Houck admits. With 15 degrees of flap, by the time you have advanced the power and monitored it sufficiently to set 950mm of manifold pressure-1,030 is the maximum allowable-the thing is off the ground like an Acapulco parasailer showing off to the girls on the beach. The yoke never moves. Come back to "eight and eight"-the Russian equivalent of running squared (800mm MP and 1,800 rpm)-with flaps in trail at five degrees, and you're climbing at a comfortable rate that I'd guess is no more than 600 fpm. "You don't do anything in a hurry in this airplane," Houck had cautioned me. The An-2 has three-axis electric trim, but rather than trim-position indicators, it makes do with three green lights that blink on only when each trim tab is at its dead-neutral position. From that point, you're on your own: the takeoff setting is one-potato two-potato three-potato up elevator, and the ailerons and rudder are set by feel. Feel? Well, let's just say flying an An-2 is like making love to a fat lady who's had too much to drink: there's a lot to work with, it's unresponsive, you're never quite sure when you're there, and it's big-time ugly. Roll control is enormously heavy and delayed: "Is it gonna turn? Oh, yeah... there it goes." Adverse yaw is considerable-a living demonstration of the purpose of a rudder. Cruise speed seems to be about 105 knots at the 45-gph, day-in-day-out "eight and eight" power setting, though the book says you can get as much as 125 knots cruise if the Party is buying the gas. There is no normal mixture-control lever, since the carburetor has autolean, but it is said that Aeroflot old heads cut the safety wire on the "emergency leaning" control and pushed it forward an inch or so (it works backward, naturally) on long-range flights. The An-2 supposedly has no identifiable stall speed. In fact, the book emergency procedure for an engine failure IMC or at night is to close the throttle, secure everything, drop full flaps, pull the yoke full aft and keep the wings level. The leading-edge slats will snap out at about 35 knots, and at a forward speed of about 20 knots, the airplane will sink and eventually hit at a basically survivable, parachute-like descent rate. I tried slow flight at an indicated 30 knots, and it didn't seem all that different than full cruise, other than the fact that the airplane eventually insisted on turning slowly left, perhaps due to a moderate fuel imbalance. At one point during my brief flight with Walker, a rainshower off the Georgia coast beckoned, and I stuck the Ant's locomotive nose into the squall. For a few brief moments, as water poured through windshield cracks, chinks, ventilators and the panel itself while two tiny windshield wipers flopped ineffectually, it was almost possible to imagine what generations of Aeroflot pilots must have experienced as they slogged through the weather at 500 meters, making rudimentary approaches into grass fields in foul conditions. Their tools? N76AN has a primitive radar altimeter, and the biggest instrument on the panel is an ADF display as big as a dessert plate. "It'll pick up a 25-watt beacon from 100 miles away," Houck claims. That and a brute of a 20-watt Balkan 5 remote-mounted comm radio-the standard Soviet airline box-are it, as far as avionics go. Time to go home, with fuel pouring through the engine at the rate of $100 an hour. Fortunately, the wind was pretty much down St. Simon's Runway 16, since the An-2 is reputed to be a bear in a crosswind. (With a touchdown speed of 30 knots, a 10- or 15-knot crosswind component can be very difficult to manage, particularly in an airplane with a huge vertical fin and fuselage side area about equivalent to that of a mobile home.) Fly the initial approach at 80 knots with flaps 15, then slow to 70 to extend flaps 30. A serious short-field landing requires flaps 40-accompanied by 14 degrees of aileron droop-and 65 knots. The electric flaps are extended with a button on the throttle right where we're used to finding a TOGA switch. They're milked back up with a button on the power pedestal. Or, if things get real busy on a go-around, you hit a red emergency flaps-up switch elsewhere on the pedestal and get rid of everything hanging except the gear. If you start playing with the flare at about 20 to 30 feet and let the airplane slow from a bit below 70 knots all the way down to 35, you just might lose enough buoyancy that the thing won't bounce too badly when you hit. But even if you do, a short blast on that big four-paddle radial will help you retrieve just about anything you do wrong as long as you're traveling in a straight line. All in all, a remarkable machine. If your idea of heaven is being able to fly backward in a 30-knot headwind while carrying an entire baseball team plus the manager for the price of a mid-range BMW, have we got an airplane for you. In February 1994, the EAA and the FAA cooperated in the issuance of a document intended to clarify the regulations controlling aircraft in the "experimental exhibition" category. That class is intended for uncertificated aircraft, or aircraft operating outside their original certification, that are approved only for use in air shows, competitions, exhibitions and other activities such as film and television use. The rules basically allow such airplanes not only to be flown to and from such events but to be flown for "proficiency." Unfortunately, an increasing number of owners had been using the "proficiency" catch-all to cover virtually any cross-country or pleasure flight they decided to make. Hence the FAA/EAA "clarification." Unfortunately as well for owners of Antonov An-2s brought into the U.S. since 1993 (earlier ones were exempt), the new interpretation of the rules specified a brand-new category within the experimental exhibition classification, called "category IV." It covers a very strange assortment of bedfellows: Lockheed C-130s, Ilyushin IL-76s (a 375,000-pound C-141 lookalike), Antonov An-24s (a 48-passenger turboprop twin), all Cessnas with un-STCed auto-engine installations... and Antonov An-2s. The rules specified that these airplanes, if registered experimental exhibition, could operate within a 300-nm radius of their chosen base but could not land anywhere within that area. They had to return to home plate. Aaron Newman, a 64-year-old New Jersey insurance agent who last May bought an An-2 from Bill Walker without tumbling to the limitations of the experimental exhibition category-"We didn't fully understand what we could and couldn't do," he ruefully admits-is particularly incensed by the category IV stipulations. He even sees a bit of a conspiracy in it. "They'd love the An-2 in Alaska," he says, "and that's why all the trouble started. I believe there was pressure brought on the FAA by Cessna, which wanted to keep selling expensive Caravans. There are 20,000 An-2s being retired all over the Eastern Bloc, and I think Cessna imagined the sky black with An-2s over here. The FAA caved in to Cessna and GAMA when they wrote those category IV rules." The truth of the matter is almost certainly somewhat simpler. The FAA saw the prospect of 20,000 uncertificated six-ton, 1,000-horsepower airplanes that could be bought for the price of a used Skylane and flown by private pilots-soloed by students, even-since their gross weight was just 350 pounds under the 12,500-pound type-rating restriction. So they said, "If you simply want to own the world's biggest biplane and display it at air shows or rent it to ad agencies, you're welcome to it. And you can do all the proficiency flying you wish, but we're going to make it impossible for you to do anything but proficiency flying, by limiting you to landing only back at your departure airport. Have a nice day." Cessna never had to lift a finger. Some Antonov enthusiasts have also pointed out that since the An-2 is currently manufactured by the Polish company PZL Mielec, and since Poland has a bilateral airworthiness agreement with the U.S., the airplane ought to simply be certificated and be done with it. However the U.S.-Poland bilateral agreement plainly states that it doesn't cover airplanes originally designed in a country that does not have a bilateral agreement with the U.S. Such as the former Soviet Union, for example. "It's been an education that I didn't know I was going to get," Newman groans.